7:00 a.m. I wake up with my left eye swollen almost completely shut. I shoot A.A. Dowd an email telling him that I can’t see the Main Competition entry The Measure Of A Man, about which I will later hear good things. I bike into Cannes with no peripheral vision on my left. 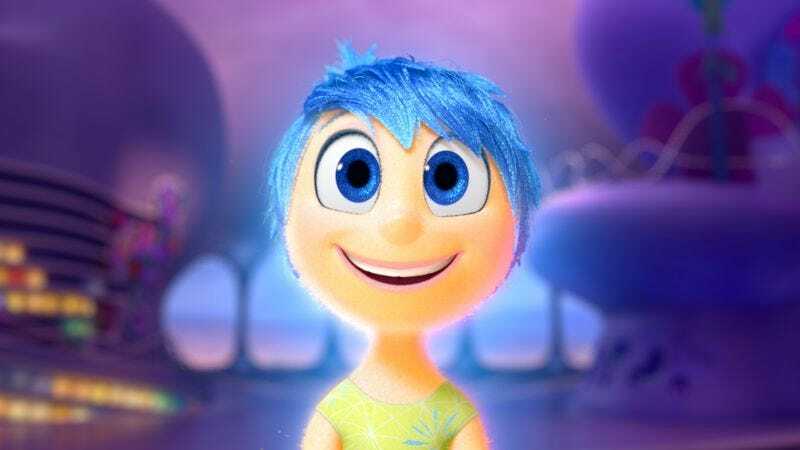 At the Grand Théâtre Lumière, I am relieved to learn that Inside Out is not screening in 3-D.
11:30 a.m. Pixar’s manic Inside Out (Grade: B) trades the wordless gracefulness and sense of discovery of the animation studio’s best work for explanatory voice-over and nonstop exposition. Maybe it has something to do with the fact that, plot-wise, this is the most abstract thing Pixar has ever done: a movie set over 72 hours inside the head of an 11-year old girl named Riley, as her emotions scramble to deal with a move to San Francisco, her first day at a new school, try-outs for a peewee hockey team, and thoughts of running away from home. Riley’s headspace is visualized as a Roger Dean-esque landscape of cliffs and floating islands, controlled from a bone-white tower that rises out of an abyss—the place where faded memories go, one of those signature Pixar visions of oblivion. Though widely seen as the technical and aesthetic cutting edge of big-budget animation, the studio has a long-standing fixation on themes of obsolescence, here embodied by Bing Bong (voiced by Richard Kind), the forgotten, elephant-trunked imaginary friend who lives in the outer reaches of Riley’s mind, carrying treasured memories in a bottomless knapsack. Of all of Pixar’s discarded misfits, he may be the saddest. In a way, it’s Up in reverse. The earlier film, also directed by Pete Docter, never managed to re-capture the pathos and wonder of its opening stretch, whereas this one grows more poignant as it gets further into Pepperland psychedelia, with Joy (Amy Poehler) and Sadness (Phyllis Smith)—sucked out of the control tower by accident—wandering through Riley’s imagination, crashing the movie studio where her dreams are made, and sneaking into the underground dungeon of her subconscious fears, home to a giant birthday clown. Despite a handful of aesthetic breaks—faux-handheld shot, a brief 2-D animated sequence—this stays well within the bounds of Pixar’s established house style; I can’t help but wish that something this conceptually out there were more visually adventurous. 4:30 p.m. “I can only read minds.” Minimalist, almost skeletal, Apichatpong Weerasethakul’s first proper feature since the Palme D’Or-winning Uncle Boonmee Who Can Recall His Past Lives is set around a makeshift hospital, where a middle-aged volunteer (Apichatpong regular Jenjira Pongpas) befriends a psychic and a young soldier afflicted with a mysterious sleeping sickness. Playing in the Un Certain Regard sidebar, Cemetery Of Splendor (Grade: B / B-) might be the director’s least accessible feature—or at least the hardest to tune into. And yet it’s a film of remarkable purity and simplicity, modulated between the earthy and the otherworldy. Here, blob-like sea monsters and shrine-dwelling sister-spirits fit side by side with a scene of a man shitting in the woods and a sequence where nurses giggle while playing with a sleeping patient’s erection. Out of all of Apichatpong’s features and shorts, this is perhaps the one that most betrays the influence of the Taiwanese great Tsai Ming-Liang—whose Journey To The West recently opened Stateside—especially in its surreal gestures of empathy. Apichatpong’s movies are often beautiful, but unconventionally so, because he doesn’t compose his shots in easy thirds—in other words, he doesn’t compose them in a way that makes them easy for a viewer’s eyes to scan. With the exception of a trip to a night market and a scene in a movie theater, Cemetery Of Splendor unfolds almost entirely in daytime, in the hospital—a former school—and on the grounds around it. In Apichatpong’s hands, daylight is somehow more disorienting that darkness. But this is the kind of film that’s trying to take its viewer somewhere—specifically, to the final 10 or so minutes, which kick off with the first close-up of the movie and then introduces camera movement and a non-diegetic score into what has, up until now, been quiet and static. For me, at least, this end space—it wouldn’t be right to call it an endpoint—refigured the whole preceding experience. 10:01 p.m. Marguerite & Julien (Grade: C / C+) may be the most goddamn confounding thing I’ve seen so far at Cannes—and that’s saying a lot, considering that the Main Competition already includes such bona fide oddities as The Lobster, Sea Of Trees, and Tale Of Tales. Valérie Donzelli’s fable has the camera style of a mid-’70s Italian film (zooms, diffusion filters, etc. ), the production value of a film school thesis project, and the plotting of an early Guy Maddin movie, involving an incestuous romance, a Spanish mother-in-law who is always seen playing cards, and a midnight escape aided by a chimney sweep, all framed as a story told by girls in a Victorian orphanage. Based on a script originally written for Francois Truffaut, Marguerite & Julien is probably no one’s idea of a good film—an extended flight of fancy that continually reveals itself as a failure of imagination, at once highly stylized and effectively style-less. It is, in other words, perversely watchable, from Donzelli’s slapdash compositions, which continually suggest a production running out of film stock and daylight, to the leaden whimsy.